What is the state of your heart? Are you nearing an eclipse? On a day that the entire world is obssesed with a solar eclipse, I started to study the photos depicting the progress of an eclipse and I got a wild thought! Spiritually I have long battled with a familiar foe to our devotion to Christ, materialism. Years ago I cherished my possesion too greatly, but that has softened. I now appreciate the things I own and enjoy, but do not over-value them. The enemy is not only evil, he is sneeky! Let me give you an example, one I hate to share. I’ve found something interesting about photographers, as a group, they generally like much of the same things, and don’t ask me why, I don’t know why…. they just seem to! Many of my photographer friends are also in to watches, audio equipment as well as photography gear. Some years ago when the America From 500 Feet book came out I bought myself a gift, a Breitling titanium chronograph worn by many pilots. It was, for me, pretty expensive, around tewenty five hundred bucks. Well I loved that watch and it started a flurry of watch purchases the vast majority far less expensive than that one. I would get online and look at the watch websites, and order anyone I liked. I soon had a large collection of over 35 watches! I soon discovered several things about collecting watches, you can only wear one at a time, and it’s a chore to keep them wound and set correctly and keep the batteries changed in the quartz watches!!!! You know what they say, ” a man who owns a watch always knows what time it is, a man who owns many watches never knows what time it is!! !” That’s becasue they all say something different!!!! My point is this is a textbook example of obsession! If you are spending most of your time looking at them, studying them, and admiring them and not enough time in prayer, reading the word and enjoying your family that’s not good! Watches are not bad, but being obssesed with them is. Apply this to anything you find yourself obsessed with, then pray about it. I’m giving away watches to grandchildren, friends and complete strangers. 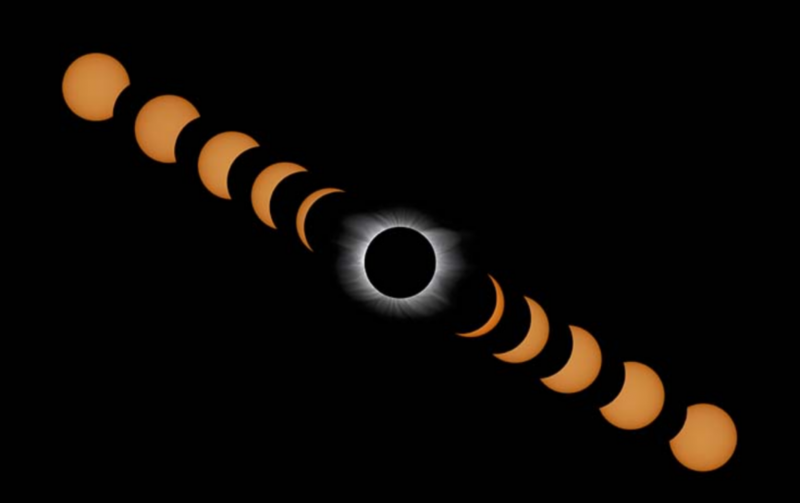 The image at the top of a eclipse progression shows how insidious an obssesion can be, it starts as a little sliver and before you know it, it has blocked out all light! Another way of looking at obsessions is they block out the light of God. Anything that commands more of our attention than Him is not a good thing. Watches are not evil, cameras and lenses are not evil, stereo gear is not evil, but if we find ourselves worshiping them by the amount of time and thought we give them, that is evil. I confess my sin, I have counted many of these things as of far greater importance than they deserve in my life. I recognize this does me great harm, and I, with God’s help, intend to place my heart and mind back on what is most important, my relationship with Him! Today’s eclipse will be a wonderful example of the spectacular nature of the universe He created, just don’t let your interests and possessions, eclipse your heart! Wow, forgot about firearms and ammo!!!! Do as I say, not as I have done!! Best sermon I ever heard!!! Confession is good for the soul, espefially mine! Truth has that affect on us!!!! So well said. A good friend not only lifts us up, a good friend also points out our weaknesses. I have a new task in front of me, a reminder of what matters. Thank you, dear friend. If I had a dime for everything you’ve taught me through word and deed, I would be a wealthy man, come to think of it, with your friendship, I am!!!! It is strange how easy it is to over-value things and under-value friendship, trust, faith and love in our life …. great words my brother! That blog post was the result of the Holy Spirit’s convicitng my spirit and I felt I had to share it. It’s hard to admit your faults, even though youn know pride would prevent you from doing it, you must be obedient above all. So I lay exposed, but God is more lifted up when we confess our sins! Great analogy Bill. And thanks for sharing it on a personal basis…I too have seen this same thing in my own life…and only through my growing relationship with Christ have my eyes been opened. I think I will grab me an eclipse photo and place it where it will remind me what I really need to be storing up. We all need to do that, great idea! I can’t express how much I appreciate the ministry you have here. You do truly minister. Our Lord has got you in such a great place. Kudos to you for answering that call. This message along with the one you wrote yesterday are so powerful. Such great reminders of where our focus should truly be. I confess, I get carried away with my obsessions too. Its really probably a good thing I can’t afford those obsessions. I would get carried away and lose track of what I should be doing. Thank you for this reminder. I needed it. Thank you for your messages and pleasant website. It’s definitely all too easy to become caught up in gear and technical aspects of not just photography, but life and “things”. Thanks again for the reminder, and actually hosting a blog in which it is professional updated on a regular basis. Of all the regional blogs and websites I’ve come across, yours is truly worth visiting.